Business phone systems for nonprofit organizations. People who work in nonprofit organizations have a singular focus: to do good work and support the causes they care about the most. However, their work is dependent on reducing overhead and being as efficient with their time as possible. Communication is also a key component of nonprofits, so having an affordable and streamlined office phone system should be top priority for organizations large and small. What should nonprofits be looking for in a business phone service? Nonprofits are often looking for ways to maintain their work and outreach within tight budgets. With Ooma Office, our customers save an average of more than $6,000 over three years after making the switch. Nonprofits also vary widely in size. A small charity with a team of 2-3 people will have different office phone needs compared to a large food bank with more employees and a larger distribution, for example. Because of this, business phone systems for nonprofits need to have a lot of diverse features to meet multiple needs. Nonprofits also need an office phone system that’s scalable, flexible and reliable. A lot can change in a matter of months in any given organization – so you need a system that’s able to grow with you. Our popular virtual receptionist feature has had such a positive impact on organizations that some have commented that it’s like having an additional employee. All-inclusive pricing: Sticking to a budget is important for a nonprofit, which is why we’ve made pricing simple and straightforward. All Ooma accounts come with a business phone number, toll-free number, a virtual fax for your organization’s documents, and a conference extension line. Easy DIY setup: To keep up with the pace of a nonprofit, you need an office phone system that’s reliable and scalable. 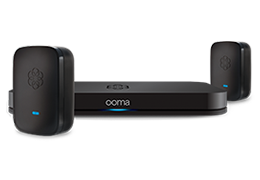 With Ooma’s easy DIY setup and installation, your workers can be up and calling in minutes. Virtual receptionist options: Organizations have commented that having this feature is like having another employee at the office. You can customize greetings, create settings for business hours and afterhours, create voice messages for frequently asked questions, or simply route calls to the right individual at your organization. Mobile access: Nonprofit work isn’t always at your desk – in fact, many of your workers will be out serving their community or cause, but will still need access to their main business line and extension. With the Ooma Office Mobile App, it’s easy to stay connected, even when you are out of the office. To learn more about how Ooma Office can help keep communications streamlined at your organization, check out our main business page to read about additional features and benefits.